This painting came about a few weeks ago and am feeling now is the time to share the message that I am being given. 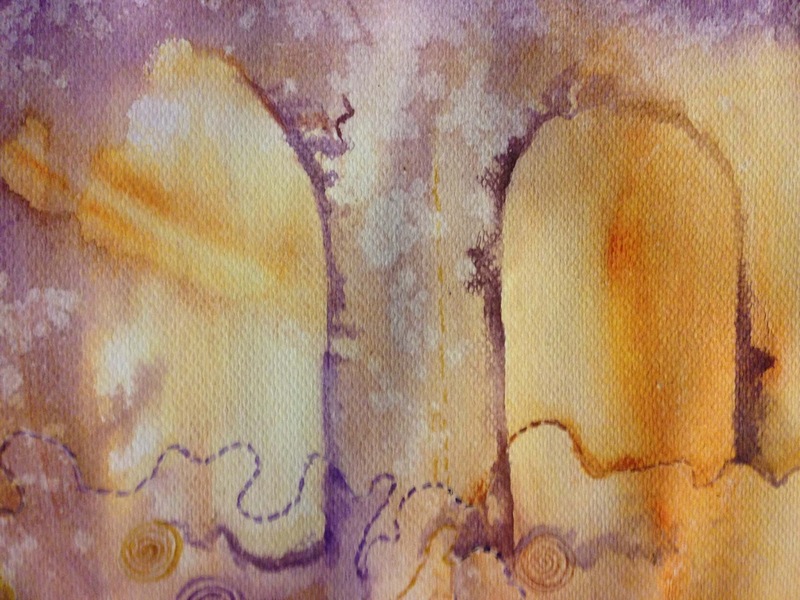 The painting, I have been led to call "Doors of Destiny" - the scripture that I was first given was Ezekiel 41:23 "And the temple and the sanctuary had two doors". The outer sanctuary and the inner sanctuary each had a double door. The arched doors are like a bridge moving us from one place to another. 2 Corinthians 3:17 " Now the Lord is the Spirit, and where the Spirit of the Lord is, there is freedom"(NIV). The light of Jesus is shining brightly through these double doors. The rays of the "Son" are beaming through and inviting you in. The thread of life is weaving its way through the doors. It all starts with a repentant heart. Psalm 51:10 Create in me a pure heart, O God, and renew a steadfast spirit within me (NIV). Three words have been resounding in my spirit. The word REVIVE is mentioned 9 times in Psalm 119. 9 is the number of finality, fullness, fruitfulness in scripture. There are 9 fruit of the spirit (Galatians 5:22-23) and 9 gifts of the spirit (I Corinthians 12:1-11). The words restore, revive, and renew I have found all have the same meaning. The words all mean bringing back something that is ineffective, broken dead, and dormant. When you restore, revive, renew something you are bringing it back to life, breathing new life into it, bringing it back into existence. But those who wait on the Lord shall renew their strength; they shall mount up with wings like eagles; they shall run and not be weary; they shall walk and not faint (NKJV). Zechariah 9:12 mentions that God will restore double to you. Zechariah 10 speaks of the restoration of Judah and Israel. Galatians 6:1 speaks of restoring in you a spirit of gentleness and in Matthew 17:11 Jesus speaks of Elijah coming first to restore all things. God’s main objective is that we pursue holiness, purity and humility. He wants to restore, renew and revive you with His breath. His breath is blowing upon you and His breath is sealing you with His promise, your destiny in Christ Jesus. There is life in his breath but whatever is wicked His breath will destroy. This painting was painted before receiving the above words. The first thing that the Lord shared with me was a picture of Him breathing what looked like a wind over the masses of humanity, stirring up the waters. I was given the words “When Shiloh Comes” and the scriptures from Revelation 5:5 and Revelation 21:27. The word “Shiloh” means “he who is sent” and is mentioned in Genesis 49:10. When Shiloh comes the rest will come. Shiloh is coming again to rule and reign. 19 Behold I will do a new thing, now it shall spring forth; shall you not know it? I will even make a road in the wilderness and rivers in the desert. 20 The beast of the field will honour Me, the jackals and ostriches, because I give waters in the wilderness and rivers in the desert, to give drink to My people, My chosen. 21 This people I have formed for Myself; They shall declare My praise. Do not remember the former things, nor consider things of old. He is doing a new thing and it shall spring forth. I give God all the glory! "The Lion of the Tribe of Judah"
I knew it would only be a matter of time before Jesus would prompt me to paint Him again as the Lion of the Tribe of Judah. 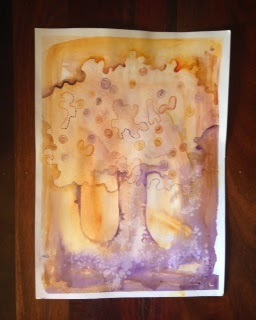 This painting started off as a picture of the Tree of Life with Iris blooms in the foreground (incidentally the definition of the name Iris means rainbow). Initially when I commenced painting Holy Spirit was speaking to me about coming in His people and giving them access to the fruit of the Tree of Life,that the tree is in the middle of the garden (Rev 22:2). Jesus being the door, He is the Way, the Truth and the Life and He is inviting us to enter in (John 14:2-4, 5). Today the painting took on a new direction and was transformed in a short period of time to the Lion of The Tribe of Judah transparently layered with paint over the Tree of Life. The nose formed over the trunk of the tree and His chin over the roots. Upon the Lord’s leading I placed the Lion of the Tribe of Judah in the painting and the painting came together in just over an hour, supernaturally guided by God. I looked at the painting when it was finished and could see an emerald rainbow around His head and the Holy Spirit told me it was a picture of Revelation 4:3 - "And He who sat there was like a jasper and a sardius stone in appearance; and there was a rainbow around the throne, in appearance like an emerald." 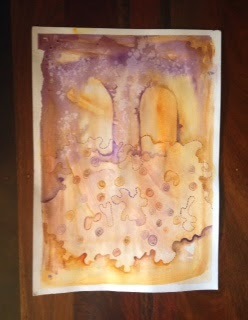 When I painted today in the spirit I watched His story unfolding before my eyes, it was God's miracle working power in motion and I was a flowing conduit for Jesus. I am in awe of Him and I love him with all of my heart. "God's Eternal Flame"- experiencing His manifest presence, the true life within. Revelation 21:3 “And I heard a loud voice from heaven saying, "Behold, the tabernacle of God is with men, and He will dwell with them, and they shall be His people. God Himself will be with them and be their God"
These words are so affirming of God's desire for His people to have unbroken fellowship with Him. The blue flame is the hottest fire. It is the most intense. The mercy seat was where the eternal flame of God hovered, the Shekinah glory - the manifest tangible presence of God. David was a pursuer of God's manifest presence. He was a man after God's heart. He entered into praise and worship - intimacy with God, a place where God reveals his glory. The glory of Yahweh's presence dwelling in the midst of His people. The Feast of Tabernacles speaks of God "tabernacling" with His people. He desires for us to enter in to the Promised Land. He is preparing us, sealing His people with His promise. He is guiding us into all truth. He is alighting us with the fire of His presence, that sweet aroma. Rev 8:3-5. Our flesh life has to be consumed by Gods fire. Death to self = resurrection life. The book of Esther takes place in the city of "Shushan"(Strong’s 7800). This word means lily in Hebrew. Throughout this book it speaks of the conflict between the flesh and the spirit. After fasting for 3 days and 3 nights they humbled themselves and became one with the Father, and submitted completely under his protection(Esther 4:16). Esther died to her self-life on the third day (resurrection day). She humbled herself to come into the King's presence dressed in her royal apparel. This time of fasting can be likened to the Day of Atonement, removing all that is not of God. The word atonement broken into syllables "at one" keeps speaking to my heart. Releasing our iniquity, being cleansed by the blood of Jesus , submitting to God's will and obeying him will provide the way, the access to the Father. God’s flame has to be kept alight. The oil fuels the fire, our prayers being anointed by the Holy Spirit. Carrying that sweet fragrance of Christ wherever we go, offering that aroma up to the throne of God. In the Strong’s concordance the number 7799(shushan) means lily. The lily is symbolic of the resurrection. This new life is formed as in this perfect, fragrant flower, full of His divine nature. In this scripture Israel is symbolic of this pure flower. The word "grow" means to blossom. The Bride, fully perfected will become one with the bridegroom, that complete, pure flower in His garden, living inside the heart of His beloved. This painting is of the second scene in a dream I had on the 19 April. The first scene was shown in the painting called "Shining like the Son" which I shared a week ago, where I saw Jesus in the sky that looked like it was on fire and His arms were outstretched. In the second scene of the dream I saw leaves encased in what looked like bubbles. They seemed to be bouncing across the sky. This new painting is called "Seedtime and Harvest". After I woke up from the dream and upon sharing it with my husband we both simultaneously received the scripture from Revelation 22:2 "In the midst of the street of it, and on either side of the river, was there the tree of life, which bare twelve manner of fruits, and yielded her fruit every month: and the leaves of the tree were for the healing of the nations". Holy Spirit was speaking to me that now is the time that God is birthing healing miracles throughout the nations. I kept remembering the colour of the sky in the dream and sensed it was connected with the colours of autumn. Autumn is the season of harvest in the natural but spiritually there are God's times and seasons too. Autumn is a time when we reap from what was planted in spring, a time to gather the fruit from the field. It mentions the harvest in 70 bible verses I discovered. Psalm 107:37 "And sow fields and plant vineyards, And gather a fruitful harvest". The trees leaves change colour in autumn and some trees also shed their leaves. Fruit ripens at this time too. 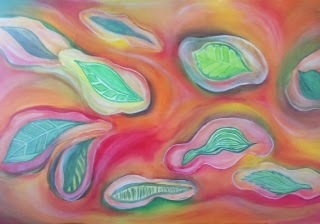 The leaves in the painting are encased like in a seed, being transformed by the resurrection life. The inside of us having that heart transformation, that new life is being birthed. (John 12:24, John 4:35, 36). Leaves encased in like seeds. A seed is new life that is found inside the fruit. A seed contains everything that is needed to grow a new plant. Metaphorically this painting speaks of healing being birthed in the nations - a harvest of souls - a season of joy (the leaves are for the healing of the nations). As I pondered over the dream when I woke up I could see God was showing me that we could liken the healings to a seed encased in a protective covering. The outer part of the seed protects the inside from all harm, because there's precious new life growing inside this protective covering that is encased in the waiting for harvest time, in preparation for the time to come forth and bear fruit. One thing about a seed is that it cannot afford to dry out, it needs to be continually fed by the Holy Spirit to survive and thrive and most importantly it requires light. Trees have three parts - the trunk, the branches and the roots. The roots absorb water from the soil and provides an anchor to keep the tree upright. The trunk supports the branches, leaves, flowers and fruit. The leaves take in food from the sun and the fruit is produced when the tree is healthy. The scripture from Ezekiel 47:7-12 has been speaking to my heart. Verse 12 "Along the bank of the river, on this side and that, will grow all kinds of trees used for food; their leaves will not wither, and their fruit will not fail. They will bear fruit every month because their water flows from the sanctuary. Their fruit will be for food, and their leaves for medicine". The River of life is mentioned in Revelation 22:1 as pure and clear as crystal and leads to verse 2 speaking of the 12 manner of fruits coming from the tree of life, plentiful with diverse and seasonable fruits, constantly bearing fruit. Eternal life is found in the tree of life and partaking of it releases healing and everything necessary to sustain life. Our spirit man is fed from this tree of life, God's everlasting love filling us completely. The leaves of the tree give life to the nations.